Since we have no Major League baseball team and no Opening Day to mark spring’s arrival, let’s have a glass of wine instead. 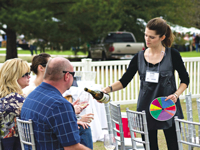 “Winefest is kind of like our Opening Day,” said Julie Musselman, the woman in charge of planning the Hilton Head Island Wine & Food Festival for the Hilton Head Hospitality Association. To be correct, what locals know as Winefest is just one of five events constituting the festival, which is now one of the most notable wine affairs in the Southeast. While wine consumption grew in popularity over the past couple of decades, Winefest coincidentally grew in scope to become a very successful destination culinary event. 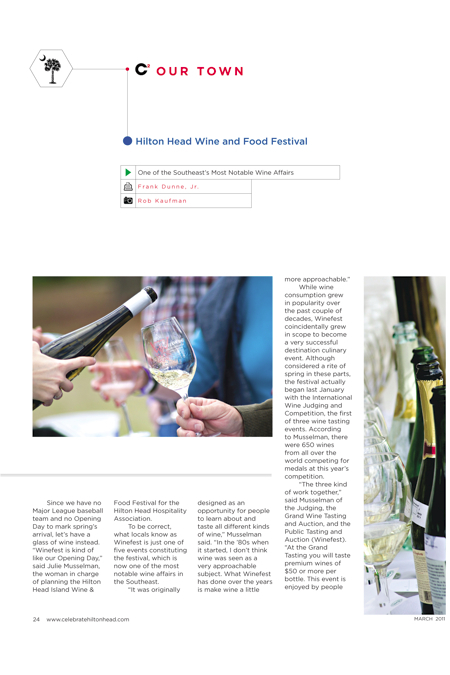 Although considered a rite of spring in these parts, the festival actually began last January with the International Wine Judging and Competition, the first of three wine tasting events. According to Musselman, there were 650 wines from all over the world competing for medals at this year’s competition. “The three kind of work together,” said Musselman of the Judging, the Grand Wine Tasting and Auction, and the Public Tasting and Auction (Winefest). “At the Grand Tasting you will taste premium wines of $50 or more per bottle. This event is enjoyed by people who are seriously pursuing a wine education or are already serious about their wine. No glass of wine is complete, though, unless it’s paired with the right food. The Wine & Food Festival covers that base with Great Chefs of the South, a weeklong opportunity to have dinner at some of Hilton Head Island’s finest dining establishments with the perfect wine for each course, and the vintner right there to tell you all about it. Some of this year’s pairings: Antonio’s and Executive Chef Yuri Gow will host Pellegrini Vineyards; Old Fort Pub and Executive Chef Keith Josefiak will host Artisan Vineyards; and CQ’s and Executive Chef Eric Sayers will host King Estate Winery. For all the details and a schedule of events, visit HiltonHeadIslandWineAndFood.com or call (800) 424-3387.